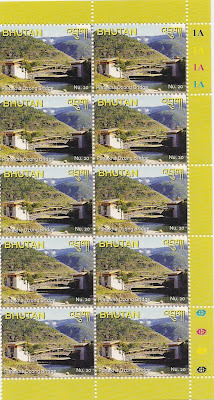 PUNAKHA BRIDGE :- MS of 2 Stamp of value 50 NU and a stamp of Value 20 Nu was released in the year 2009 to mark the opening of newly reconstructed Punakha bridge . Scott no 1425 A 215 --- 4.00 US $ . ZAM – BRIDGES OF BHUTAN-2005 . 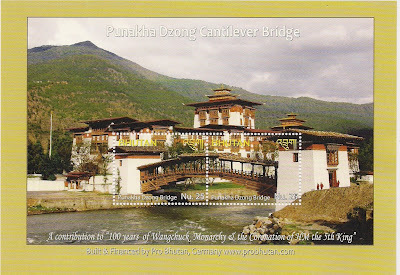 In olden days, the bridges of Bhutan played significant roles connecting villages and people in the remote and hilly terrain. These bridges are still the lifeline of the people, especially those living faraway from urban areas. Bridges of the past were built in different forms using different techniques and such bridges are made of wood, bamboo, cane and iron chains. In fact Lama Chazampa or Dupthob Thangtong Gyalpo (1385-1464), a historical figure in Bhutan, was a famous builder of iron bridges in the country. The bridges in Bhutan are also used by commuters for hanging prayer flags with the belief that sin flies away when wind blows it. Although, the government is taking efforts to re-install important traditional bridges, old bridges are slowly disappearing as these are replaced by modern concrete, bailey and suspension bridges. 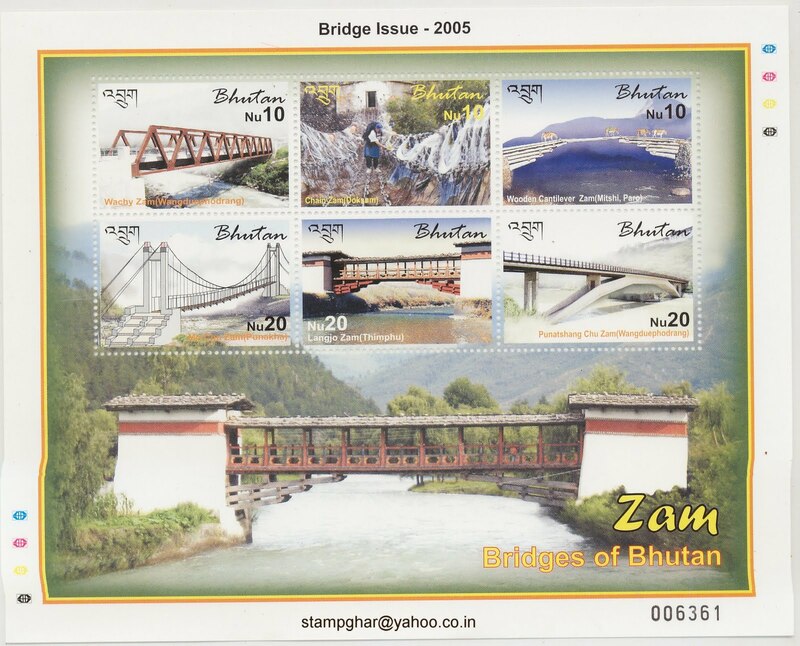 Bhutan Post has the pleasure to announce the release of following set of six stamps sheet-let featuring the “ZAM-Bridges of Bhutan”to mark the World Post Day on October 9, 2005. 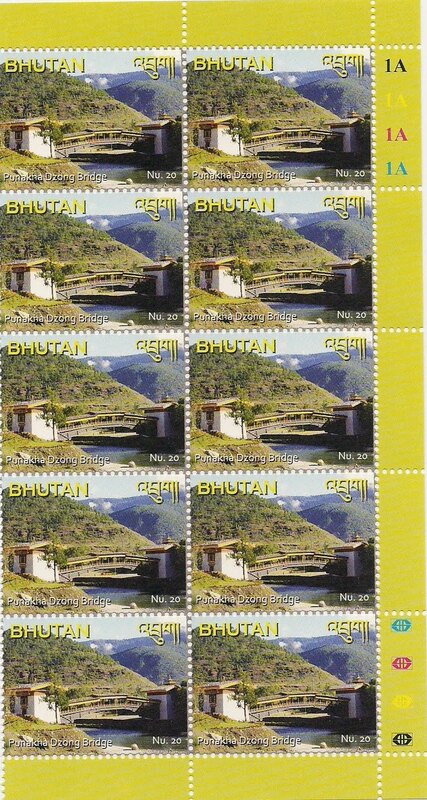 The cost of the stamp sheet-let will be Nu.90.00 equivalent to US$2.10 Wachey Zam (Wangduephodrang)Wachy Zam is located at 12 KM from Wangduephodrang towards Trongsa highway. The new Bailey bridge was built across the Dangchu River in 2003. Wooden Cantilever Zam (Mitshi, Paro)This type of cantilever bridge built by wooden logs and blanks is often found throughout Bhutan. Such bridges are still very useful for the people living in the remote areas especially during rainy season. It is located at Mitshi in Paro. 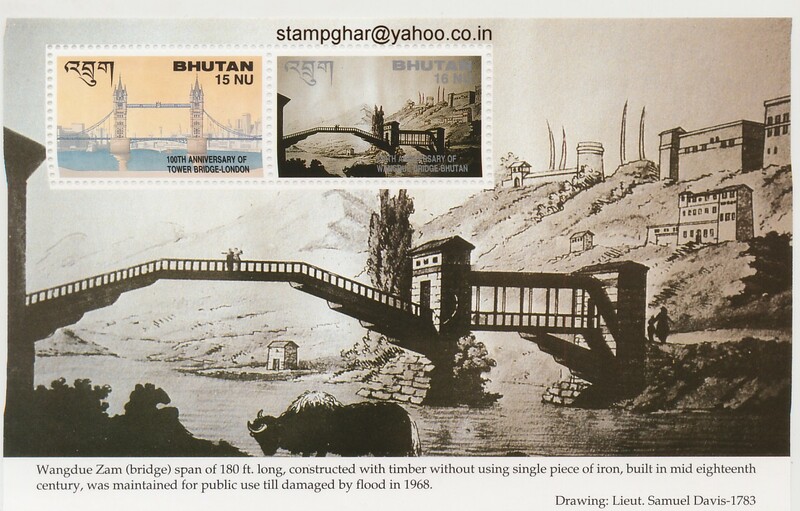 Iron Chain Zam (Doksum) Drupthob Thangtong Gyalpo (1385-1464), was a famous iron bridge builder in Bhutan. He was also known as Lama Chazampa which means the iron bridge builder. This is one of the bridge he had built over the Kholong Chu river at Doksum (now dismantled) on the way to Trashiyangtse. It is about one hour drive from Trashigang. Mo Chu Zam (Punakha) The modern suspension bridge on the (approach road to Punakha Dzong) is built over the Mochu River which has a span of 80ft. long. This bridge has also replaced the age old traditional wooden bridge which is no more exists. Lanjo Zam (Thimphu) This is a special type of cantilever wooden bridge having roof on the top is built across the river, mainly nearby Dzong or monasteries. The building structure or tower at both sides is also built to provide extra support and life to the bridge. It is located at Langjo behind Tashichodzong, Thimphu and was built over the Wangchu River in 1973. Punatshang Chu Zam (Wangduephodrang) This is the latest modern bridge built in 2002 over the Punatshang Chu in Wangduephodrang linking the West and Eastern Bhutan. The bridge has beautiful view of the Wangduephodrang Dzong on top of the hill. It is about one and half hour drive from Thimphu.